Julian Strawther (11) is the 16 year old who stands at 6 feet and 7 inches and plays for Liberty High School’s (LHS) men’s basketball team. With a game point average of 24.3, 8.4 rebounds, and 2.3 assists per game in the 2017-2018 basketball season. He was considered an honorable mention of the MaxPreps Sophomore All-American Basketball Team. 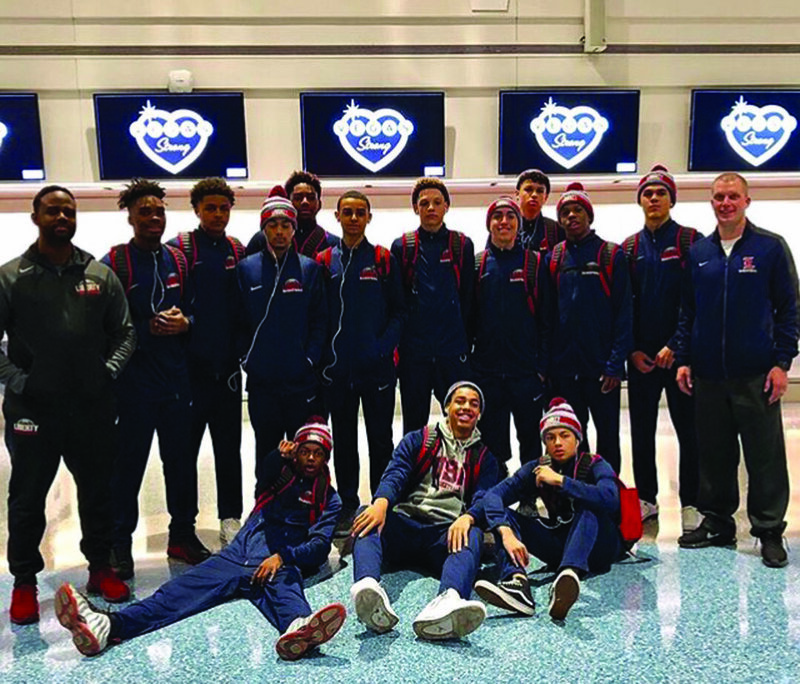 Strawther already has 24 full ride basketball scholarships, and some of those scholarships are from Arizona, USC, Washington, Kansas, Florida St., Florida, and Vegas’ own UNLV. He began getting scouted by a few colleges when he was just in the 7th grade and at that point, he was only 6 foot. Strawther began playing basketball at the age of four and throughout the years, he feels like it almost developed into a job. Usually, his everyday workout consisting of working out twice a day and at least six days a week. Growing up, he idolized Lebron James. He also states that Quincy Pondexter is his biggest mentor. He believes that Pondexter has taught him a lot about the game and has helped him get him where he is today as a player. Pondexter is a professional basketball player who currently plays for the San Antonio Spurs but played for the Chicago Bulls, New Orleans Pealicans, Memphis Grizzlies, and the New Orleans Hornets. He was drafted by 26th overall by the Oklahoma City Thunder. So being mentored by him is a big thing. “He’s taught me so much about the game of basketball,” said Strawther. If you don’t know Strawther, then you might be familiar with his last name due to his sister, Paris Strawther. Being also a graduate basketball player from LHS but she is also a college player for UNLV. This may just show that college ball runs in the Strawther family. With just a few more years to make his pick and have more scouts give him offers, he still has the 2018-2019 season and the 2019-2020 season to focus on. Let’s hope the best for Liberty’s own and for his future pick.